If you are a someone who writes content for your website, such as practice area pages or blog posts, it is likely that internal linking is near the bottom of your list of priorities. When creating content, a lot of factors come into play, from keyword usage, to alt text, to images on the page. All of these are important, and it is easy to feel a bit overwhelmed with all the “best practices” and “how-to” guides. And, many small businesses simply don’t have the budget to hire a SEO expert to curate their content for them. That is why we have put together this quick and easy checklist for you to follow when it comes to adding internal links in your site. What is an “internal link”? An internal link is a link on one page of your site that points to another page on your site. You may have done this already, by including links to your “Contact Us” page on most of your pages. An external link, on the other hand, is a link on your site that directs the user to another website. You can read our blog post, Back to Basics, to learn more about on-page SEO best practices. 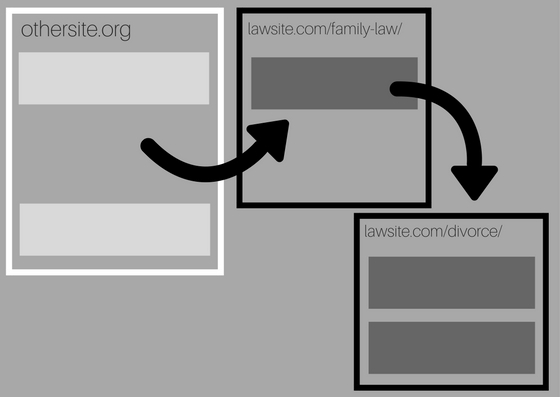 For an example of an internal link, imagine a law website, lawsite.com. 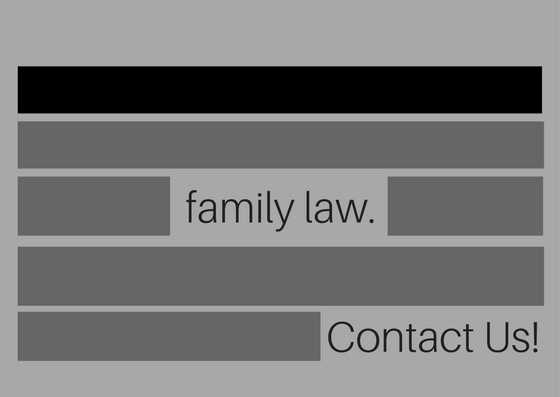 This site may have a practice area page called “Family Law”. This page is identified by the URL lawsite.com/family-law/. 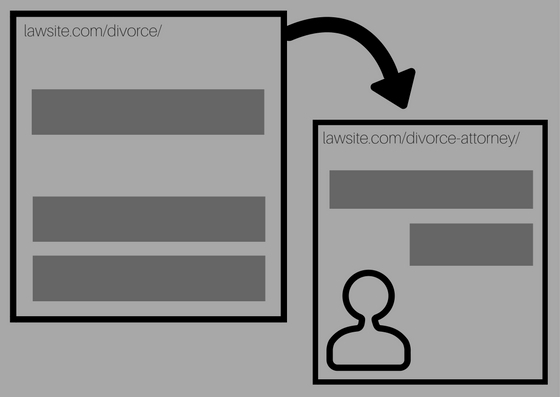 Within the content of this page, the author may include a link to another page on their site that is about divorce (lawsite.com/divorce/). The reader would get to this page by clicking on the anchor text divorce. Using internal links usually aids the natural flow of users from one page to another, but that is not always the case. Often, content creators include internal links just for the sake of a link. This is not the most optimized strategy for internal linking, and sets the basis for this guide. What’s the purpose of an internal link? Including internal links on your site actually serves a variety of purposes. More important than just SEO, internal links are a way of directing readers around your site. The most important purpose of internal linking is to help readers and customers that are using your site. Search engines prioritize content that is helpful to the user and provide a great user experience. When it comes to link building, always consider what information your potential customer may be looking for, and then provide links to that information. We have compiled our best tips and tricks for internal linking into an easy-to-follow checklist for you to use when creating and updating the content on your site. After reviewing this list, you may consider going back over old content and removing any internal links that are not providing a benefit to your potential customers. Include links to other pages on your site that are relevant to the page you are linking from. If you are linking from your “Employment Law” page, linking to your “Worker’s Compensation” page would be a good choice. Do not link to a page that does not make sense for that page, such as your “Personal Injury” page. This is not helpful for the user, and it confuses search engines. 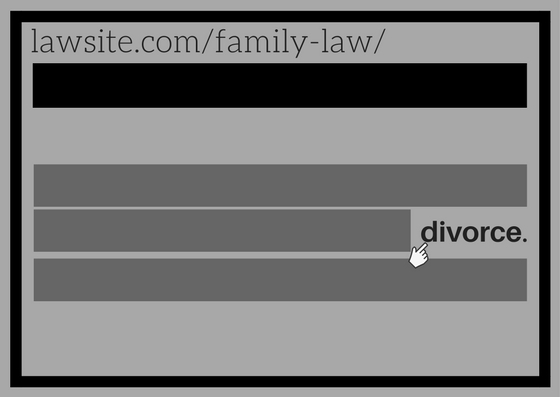 Anchor text is the word(s) that users click on that directs them to page you are linking to, such as “divorce” in the earlier example. Anchor text, like internal links in general, should be helpful for the reader. This is not a place to stuff in keywords in order to boost your rank in search engines. 1-3 words usually suffice, and the text should give some indication what the next page is about. DO NOT use “here” or “click here” repeatedly, as this is can look spammy. Anchor text is an opportunity to direct users to other pages on your site. Be as helpful as possible, for both the user and search engines. You want to make it as easy as possible for users to find the pages on your site. Most businesses include their most important pages, such as their “About” page, blog, and practice area pages in their main menu. This makes it so those pages are only 1 click away and thus very easy for users to find. If your site is set up correctly, no page should be over 3 clicks away. 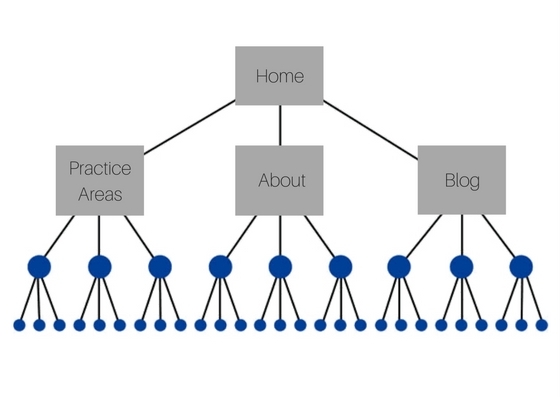 The ideal internal link structure is more like a pyramid. You will have your most important pages included in your main menu. These pages then link to other pages that are relevant to them. Here, the blue dots are pages that are being linked to from the main menu pages, and so on. Note that no page is farther that 3 clicks away from the home page. This is ideal, as it makes it fairly easy for users to find what they are looking for. Note that the Search box is not an option, as search engines will not utilize the search box to find your pages, and a user may not know what to search for. Having all the information as accessible as possible is best for your potential customers. 4. Don’t Have Orphan Pages! Visit this latest blog post to learn how to find and fix orphan pages. This step is a little more advanced, but pretty simple once you understand the basics of internal and external links. If you have pages on your site that have received links from other reputable sites (i.e. inbound links), it is beneficial to link to other pages on your site from these pages. The idea here is that an external link from another reputable site adds authority to that page. By linking from that page to other pages on your site, you are sharing the love, so to speak. To find out which pages on your site have backlinks from other sites, use can use Moz’s free tool, Open Site Explorer, or the more robust tool at ahrefs.com. The most important purpose of internal linking is to provide a route of helpful information for your readers. Not only will this result in a better experience for potential customers, but will lead to payoffs in SEO and your overall business. By linking to relevant pages, optimizing anchor text, and having an organized internal link structure, you can increase traffic flow on your site and drive growth. Don’t forget to go over older content to make sure that you are linking to pages that serve the interests of your users. Be sure to visit our SEO blog for even more tips and tricks. Feel free to leave your questions in the comments below! Great Job! A very simple and informative article.